For some reason, online poker Bad Beat Jackpots seem to lead to more than their fair share of controversy and disputes. We've already covered the sneaky changing of BBJ terms and conditions by the Chico Poker Network in 2018 and fears of jackpot funds confiscation by Betcoin.ag when it briefly closed its poker room at the end of 2017. The latest Bad Beat Jackpot kerfuffle surrounds 5Dimes and its Grand Poker Room, which failed to pay a legitimately won Bad Beat Jackpot of more than $53,000. However, pressure from the player community and intervention by a leading player advocacy website convinced 5Dimes to change its tune and eventually award the player the money he was owed. This incident has generated a lot of attention, and we decided to contact the player involved, a gentleman named Paul, to gain a more complete understanding of what exactly transpired. Paul is in his late 30s. He's a construction worker in Central New York, living in a small town with his wife and their two little girls. When he's not busy installing furnaces, upgrading plumbing, engaging in electrical work, and all the other tasks involved in his trade, Paul like to relax by taking his family on camping outings and, of course, by playing internet poker. Paul stopped playing online poker, like many, when Black Friday hit in 2011, depriving him and other Americans of access to the two largest sites: PokerStars and Full Tilt. However, Paul started to get interested in returning to the game about three years ago, and a friend recommended 5Dimes to him. Paul contacted support to inquire if he was allowed to play in the weekly $500 freeroll, and he was told that this was fine. He was lucky enough to take third place in the first such tournament he joined, and from there, he built up his balance to about $800 over the years. Throughout this entire time, he mostly enjoyed the real money cash games, finding the 10:00 p.m. starting time of the Sunday $500 freeroll too late to register for often. Paul generally doesn't play much poker during the summer months, but in the winter, when work typically slows down a bit, he likes to head online to the virtual card games. This is just what he did on Friday, Dec. 28, 2018. While seated at a $10NL game, Paul and his tablemates were berated in chat by an individual who called them “dumb” for not playing at a Bad Beat Jackpot table. This guy was probably hunting down fish to play against at higher stakes, and it seemed to work because Paul joined him at a $25NL BBJ table. Little did this chatbox inhabitant know how prophetic his comments would prove to be. Perhaps eight minutes after joining the $25NL table, Paul received A8 as his hole cards and min-raised from the button. The 8♠ J♥ 8♦ flop went check, check. Then the turn came down the 8♥, giving Paul a monster four-of-a-kind. Paul bet half-pot ($0.50), and his opponent called. Then on the T♥ river, the fireworks started. The other player bet out, Paul raised, and he was met with an all-in reraise. Naturally, Paul called, and the hand went to showdown. His opponent revealed the 9♥ 7♥ for a rivered straight flush. Notably, 5Dimes doesn't require that a pocket pair be used to make four-of-a-kind. Thus, Paul's A8 was good, and because the A played as a kicker, he met the rule that both hole cards have to be used at showdown. It's also interesting only two players need to be dealt into the hand at 5D to be eligible for the Jackpot; at many other rooms, there's a four player minimum in effect. 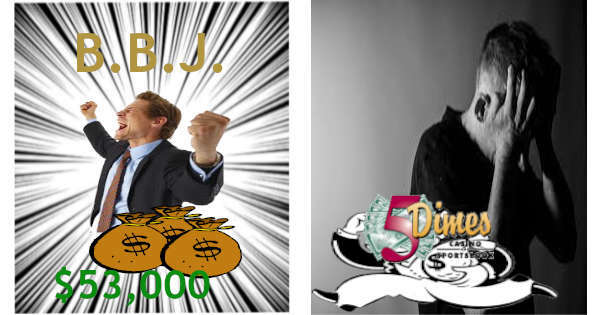 Whenever the BBJ is hit, 5Dimes awards 60% of the pool and retains 40% to reseed the kitty. As the “loser” of the Bad Beat Jackpot, Paul was entitled to 50% of amount paid out, which was more than $53,000 in this case. Paul thinks that his share was $53,686.23, but he's not sure because the pop-up message informing him of his great fortune only remained visible for a second or two. The winner of the hand got 30% of the funds distributed while the remaining 20% was earmarked for the other players involved in the hand. Because the hand in question was heads-up, we're not sure exactly what happened to this 20%. It's possible that it went to Paul's opponent, but maybe it was returned to the jackpot fund. Paul stated that the amount he won was more than a year's wages for him, and he intended to devote the cash toward paying down his credit card debt and reducing the balance owed on his mortgage. Little did he know that 5Dimes had other plans in mind. After working some overtime on New Year's Day, Paul logged into his account to find that his money was gone! 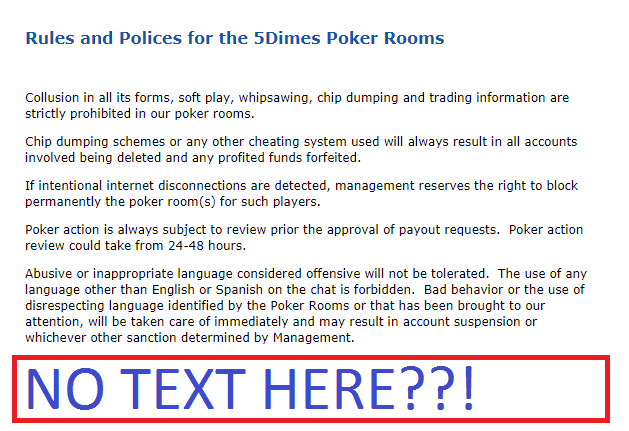 He contacted support and was told that promotions, like the Bad Beat Jackpot, are for active, depositing customers only. They accused him of taking advantage of the site by building up a bankroll from freerolls – the very freerolls that he had asked in advance if it was OK for him to play. I understand you don't see this as an abuse of any of our bonus programs however, playing for three years without making a deposit, using our software and possibly taking time from clerks and people behind all the business which cost some money as well, let me tell you that is abuse. Paul wasn't born yesterday, and so he knew that he had resources available to him, namely the worldwide community of online poker aficionados. He posted about his experiences on the forums at Twoplustwo, Reddit, and Sportsbookreview. After learning of this affair, Sportsbookreview intervened on behalf of Paul, and they were successful in persuading 5Dimes of the error of its ways. This poker operator (although mainly a sportsbook) has made an about-face and is now agreeing to pay Paul the full amount due to him. 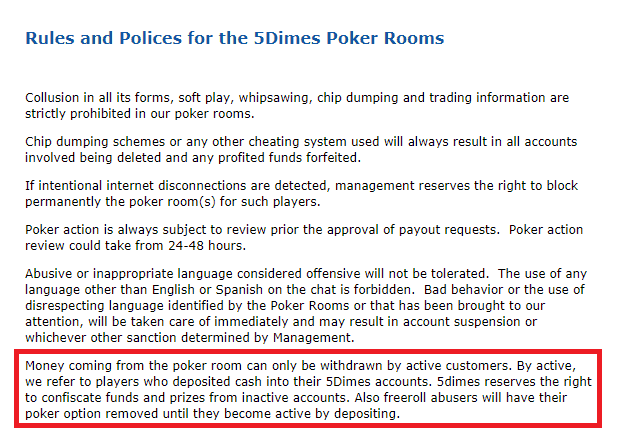 5Dimes stated that the rule regarding paying out poker promotional money to active players only was supposed to go live on the website earlier, but due to a mistake, it was not published until after the jackpot was won. This line of reasoning sounds a bit sketchy to us, but the main thing is that Paul will be receiving his cash. A juicy piece of information that's mostly unrelated to this dispute but that our readers might find interesting is that the owner of 5Dimes is missing and presumably dead. William Sean Creighton, aka “5Dimes Tony,” an American resident of Costa Rica, was kidnapped from his car in September 2018 and held for ransom. Despite the ransom (close to $1 million) being paid, he was not returned to his family and hasn't been seen since. “Tony” was known to have an abrasive personality, and he would sometimes berate his own customers through email and live chat. He was especially harsh on those whom he felt – rightly or wrongly – were trying to take advantage of him and his company. It's clear that the spirit of “Tony” seems to still suffuse his organization, at least among customer support workers, even during his absence. Many thanks to Sportsbookreview.com. Their ability to mediate these matters is amazing. Great people who are keeping things fair. This would not have happened without them. I was also surprised how quickly I was given support from internet strangers that gave good advice and well wished across several forums. The last time we made contact with Paul, he hadn't yet requested a payout from 5Dimes. He explained, “It sounds like crypto is the way to go,” but he was uncertain of how digital currency worked and was reading up on it. For anyone in a similar position, we've prepared a guide to Bitcoin online poker that explains, in step-by-step detail, how to acquire bitcoins, deposit them for real money gaming, and collect your winnings. Paul has confirmed that he has received payment from 5Dimes. He requested his first payout on Jan. 13 and had the funds transferred to his wallet on Jan. 16. Paul has informed us that he will continue to post information regarding 5Dimes withdrawals on the Twoplustwo thread devoted to this subject. Paul made his withdrawal via Bitcoin, and he told us that he considered our guide to using this crypto-currency (linked above) to be “the most useful I found in my research.” We are glad that Paul was able to benefit from our BTC walkthrough; we created it specifically to help poker players who might be confused by the world of Bitcoin. If you're currently uncertain as to how this digital currency works, then we encourage you to browse over to this page to obtain the knowledge you seek. This entire episode illustrates the power that online poker players have when they come together and unite around a common goal. While it's possible that 5Dimes would have eventually done the right thing on its own, it's more likely that the unwanted attention and bad press that it was receiving played a major role in the reversal of its initial decision. 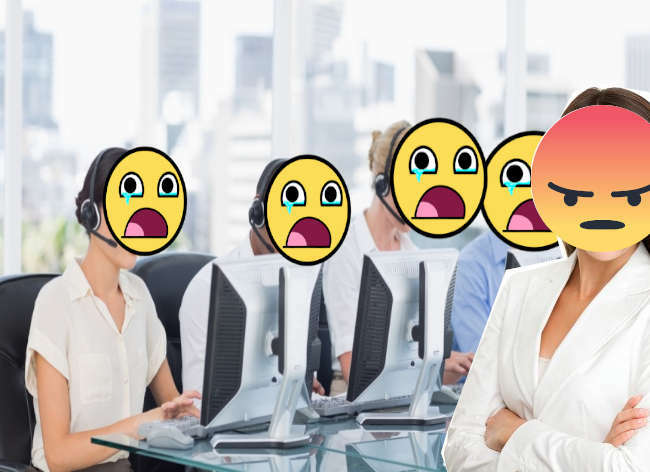 We here at ProfessionalRakeback frequently browse through internet forums to identify important information that we wish to share with our readers, and indeed, it was through these same forums that we were alerted to Paul's case in the first place. We also publish a monthly offshore poker payout report based upon information reported, on publicly accessible channels, by real-life customers of the internet gaming sites. We urge you to make a post whenever something happens, good or bad, with your online poker, casino, or sportsbook provider. It's only by comparing what others have to say about them that we can form an accurate idea of which sites deserve to be trusted with our money and which ones we should stay away from. This is one of the most powerful tools at our disposal to ensure the integrity of the entire industry. Ready to Play at 5Dimes? Despite the hassles Paul had to go through, 5Dimes did, in the end, confirm that his winnings were legitimate and said that it will pay him. This, in combination with its stellar rating at many review sites, has convinced us that it remains an upstanding business notwithstanding any small issues that may occasionally crop up. If you want to open up an account at 5Dimes and perhaps be lucky enough to snag a bad beat jackpot payment of your own, then we'll show you how to do so in our Grand Poker review page. If the events described above leave you in search of a different internet cardroom instead, then be sure to consult our overview of the best USA online poker sites.